The morning was warm and I awoke in a patina of sweat. I roused Sheena, swung my legs over the sleeping ledge and lowered myself into Nacho’s cabin. Already the sounds of the temple and the town filled the air. Monks chatted with one another, street touts advertised their wares, and tourists fended off obnoxious tuk tuk drivers. 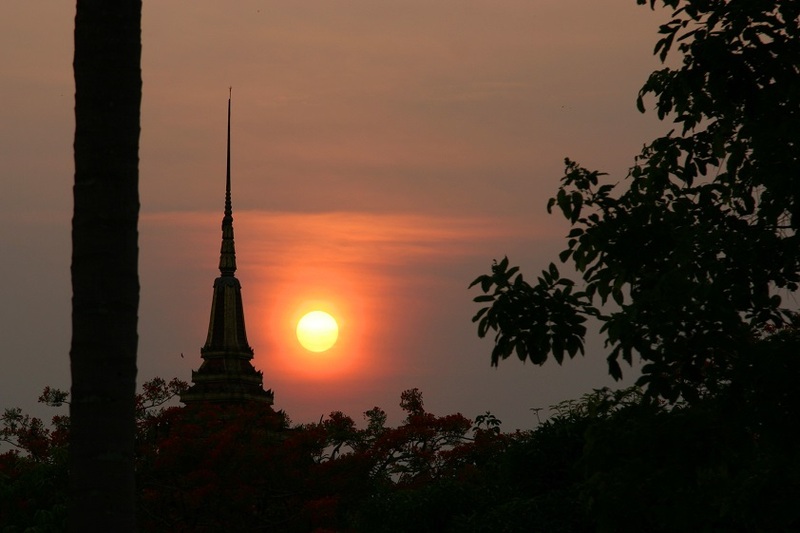 The sun beat down on me as I walked to the line of huts where the monks lived, perched atop stilts behind the temple. I blinked several long blinks to let my pupils adjust to the sunlight as I walked. “Excuse me,” I called out, “do you speak English?” The monk standing in the doorway shook his head and pointed inside. He went back into the house and emerged with another. “Yes?” the second monk said, shyly, as he adjusted his orange robe. He looked to be about 18 years old. “We’re ready to go. Do you have the keys to the gate?” He disappeared into the house and emerged with a ring holding a couple dozen old keys. He trotted down the wooden stairs and fell in step beside me as we walked back to the gate enclosing the temple grounds. 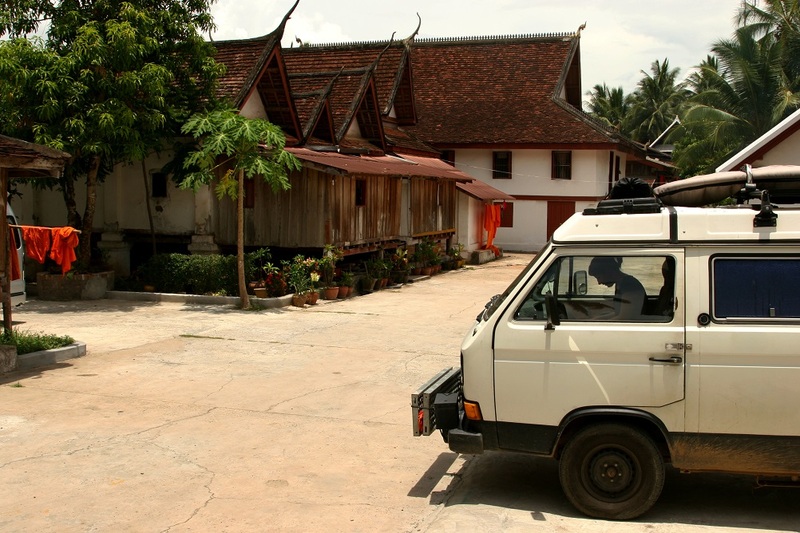 We’d arrived in Luang Prabang the previous day around lunch time, plenty of daylight left to secure a suitable campsite—a seemingly simple task, until one considers the state of camping in Southeast Asia. In South America we were spoiled by the ubiquity of camping options. Most nights we slept in the wild near rivers or rock outcroppings or deserted vistas. Over the course of our final five and a half months in South America we’d spent only one night in a hotel. One night in a hotel to one hundred and sixty five nights of camping. In Southeast Asia, however, finding places to camp has been no easy task. What undeveloped land there is usually remains undeveloped because either it’s covered by impenetrable jungle, it’s too steep to walk on, or it’s polluted by unexploded land mines. “Camping” has been reduced to finding a suitable parking place in a low traffic area where we can draw the curtains and imagine that we’re surrounded by nature. 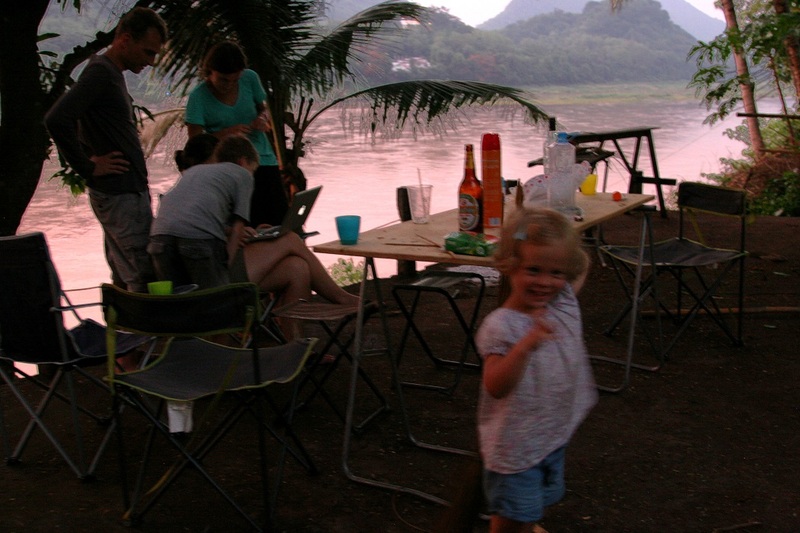 After an hours-long search for a suitable camp spot in Luang Prabang we came up empty handed. 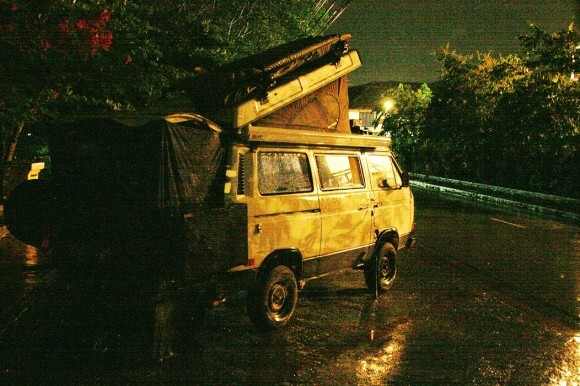 We asked at hotels, hostels, and shops if we could stay overnight in their parking areas, but were refused. We drove endlessly up and down the outlying roads looking for anything resembling privacy. Nothing. But there was something. 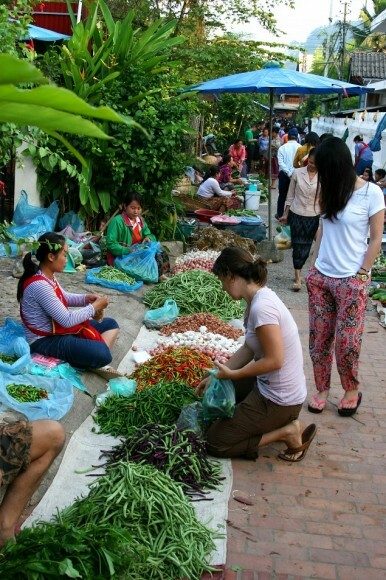 When we had first set tires upon Luang Prabang’s streets I had suggested it, but Sheena outright refused. Only after reaching the point of exhaustion, she relented. We drove to the temple in the bull’s eye center of town, found some monks, asked about camping, explained what we meant by drawing pictures, were invited to come chant with them, gained permission to camp, drove inside of the temple grounds, popped the top, and drank a beer. We had forgotten to ask if drinking beer in the temple grounds was cool, so we did so with curtains drawn. “Do you mind if I try the key?” The young monk had worked his way through all two dozen keys, but none would open the gate’s lock. The sun had long since cleared the horizon and now bore down on us from the cloudless sky. The poor guy doesn’t know how to use a key, I thought to myself. He handed me the ring of keys and I started trying them in the lock. Nope. Nope. Not that one. Nope. I worked through all of the keys and stated with the utmost authority to the young monk that indeed, none of these keys was matched to this lock. The boy retreated to his hut. A minute later, he returned with an older monk, one who had been there longer and had more knowledge of keys. The older monk took the ring of keys and proceeded to try each one. When he had finished, he started over at the beginning and tried each one again with more twisting force. I watched him as he applied all of his strength to each key, and I hoped that none of them would break off in the lock. By now a crowd of monks had formed around us. The foreigners were trapped in the temple, and that was something to see. Whoever had locked the gate the night before had misplaced the key, but the monks weren’t ready to accept defeat. They worked diligently and with good humor to find the right key for the job. A third monk, even older than the first two, decided that the problem was not with the key, but with lack of experience. He took hold of the key ring and went through it twice, testing each key and turning it with great force before conceding that in fact the proper key was missing. The foreigners are patient, but the sun is high and the day is getting hot. How long will the foreigners remain calm? We must get them out of here before it’s too late! A young monk, acting on orders from an older one, ran behind a building and returned with a fist-sized rock. He began feebly smacking the lock with the puny stone, an action which caused the gate to ring out like a temple bell with each awkward swing. His aim was sloppy and he began hitting his fingers on the metal of the gate. “Hold on,” I said—a command not understood to Laotian people not well-versed in English. I held up my hands like a traffic cop until the boy stopped smashing his fingers, and then I walked over to Nacho. “What’s going on?” Sheena asked. I told her that they’d lost the key, and that I was going to have to coordinate a jailbreak. I opened the ammo can on Nacho’s front bumper and pulled out the switchblade hack saw that I’d picked up at the Home Depot, but hadn’t yet found occasion to use. The monks were excited by this, and motioned for me to give it to the oldest, wisest monk. The wise old monk began timidly sawing at the lock, but his efforts were fruitless. The blade repeatedly slipped off of the shiny chrome surface of the lock’s shackle. After a while I took over. After getting halfway through the shackle I stepped aside and handed the saw to a young monk so that he and his fellow monks could own the glory of finishing the job. Finally, after several of us were covered in sweat, the blade passed through the shackle. In the movies, this is the point where the lock victoriously falls open and we make our escape. But in Laos, escape scenes unfold much more slowly. Despite the shackle being cut, the lock still inexplicably refused to open. The young monk picked up his fist-sized stone and continued feebly smacking the lock. I made traffic cop hands and retreated to Nacho, returning with a large crescent wrench. “Stand back!” I said, and then fitted the jaws of the wrench around the lock’s body. I leaned my weight on the handle and slowly twisted the shackle until it could be removed. The monks cheered as the lock came free of the gate, and the young rock-wielding monk enthusiastically dropped his rock and slid the gate open. At this point I would normally flop around the group giving celebratory chest bumps and bottom slaps, but being that we were guests in a Buddhist temple, I restrained myself and thanked each of the monks in turn by pressing my hands together in front of my face and discreetly bowing my head while repeating one of the few Laotian words I knew—”kopchai…kopchai…kopchai…” The monks smiled and walked together back into their huts. We had won the battle, but there was still a war to fight. Our first night in Luang Prabang was behind us, but we had several to go. I could see the defeat in Sheena’s eyes before any words were said. 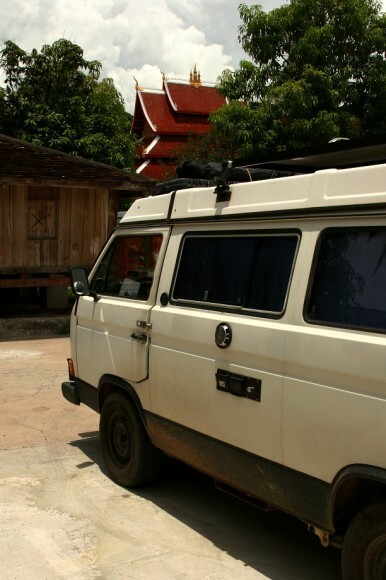 While she’s usually very picky about our camp spots, she already knew that there weren’t any good places in Luang Prabang. It would be up to my less discriminating eye to choose a suitable spot, and I quickly found one: a parking space wedged between obnoxious tuk tuk drivers on the tourist street that runs along the banks of the Mekong. I triumphantly backed Nacho into place while explaining to Sheena that she needed to lower her standards. For camping, of course. As it turned out, our new French friends had also ended up in Luang Prabang, and had chosen a similarly questionable campsite just down the street from us in a parallel parking spot. We convened outside of their camper for a picnic dinner on the bank overlooking the river. The children ran wild through the dark while we enjoyed the evening. Afterwards we strolled back to Nacho, our path illuminated by street lights; the tuk tuks had long since gone home and the street was ours. We opened Nacho’s rear door and set up the shower, and then took turns washing under the cool water on the street in the middle of Luang Prabang. Outside of the shower, of course, we imagined rock outcroppings, deserted vistas, and solitude. Luang Prabang is awesome. Did you all walk or biked around using a rental? Kenneth, we were in LB for 4 days or so, and spent most of our time walking. We rented bikes one day and rode around the area and surrounding hills. Nice place. I’ve found I really enjoy the ‘daily life’ photos, people walking down the road carrying a bundle of whatever or a fishing pole. And the food markets! 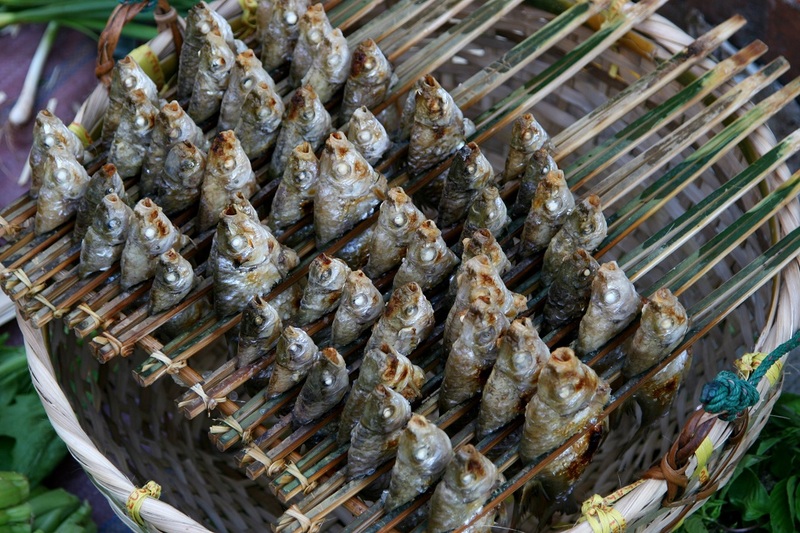 The piles of green beans on the sidewalk or the rack of dried whole fish is just so ‘different’ and still somewhat familiar.